The Ramblings of an Endurance Junkie is probably apt right about now as this weekend I line up for my first mountain bike race of the year and my first MTB race since 2003....a lot has changed in those 12 years since I was racing all over the UK in the dirt! We moved to the USA, took up triathlon and didn't touch the trails until picking up 'cross again in 2012. So it looks like the two worlds have collided for 2015. 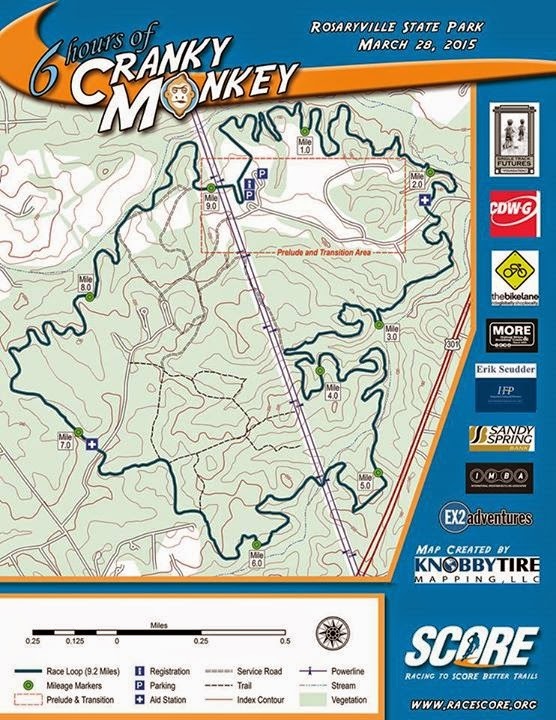 I am venturing into Xterra triathlons (off-road triathlons) so why not sign up for the Cranky Monkey 6hr MTB endurance race as a training race on the local trails. It should be a lot of fun, the weather looks good, the trails have dried up and I have some pretty good fitness right now. I'm not sure if it is 6hr MTB fitness but it is fitness. I have managed to get onto the trails a few times since actually getting my Specialized Stumpjumper in January, in amongst the rain and snow! Yes I was a little rusty but the last ride this past week was a bit better in terms of flow....I'm sure that over the course of 6hrs the feel for the trails will come back as you learn the track.